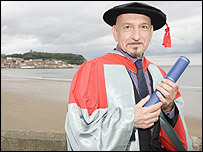 On July 20, Sir Ben was awarded an Honary Doctorate by the University of Scarborough, in recognition of his contribution to the ancient art of acting. It must be a great feeling to have your talents recognized in such a way, don't you think? I agree that it is a good and high recognition of his work, but I disagree with the Honary Doctorate system. I think that in a way it is an insult to those who go through the proper channels. I agree that it is a good and high recognition of his work, but I disagree with the Honary Doctorate system. Yes, I agree. When one writes the title correctly it is OK, or at least, better. 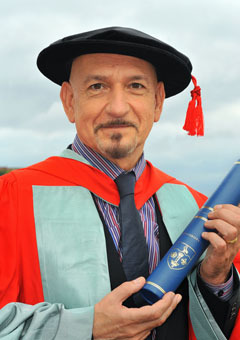 Photo is from the University of Hull's website. I like the first picture on your last post, Fagin. Very nice.